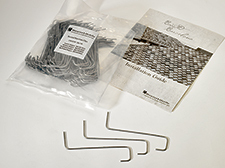 Boral Roofing offers many tools and fasteners for use in protecting your tiles from high winds. Boral Roofing's Zip-Clips are corrosion-proof clips for roof tile that help secure roof tile in high wind areas, tested up to 134 mph. Boral Roofing Wind Clips are designed to provide the maximum wind uplift resistance in an easy to install, corrosion resistant clip for roof tile. Boral Roofing's QuikDrive Screws allow for a quicker installation that increases walkability and wind uplift resistance, suitable for all tile roof installations. Boral Roofing has developed specially designed wire ties for our Boosted Barcelona tile tops.